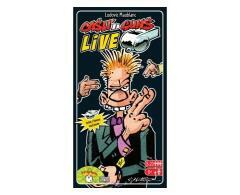 CA$H'n GUN$ LIVE, you are a gangster trying to get the biggest share of the loot. All the players try to protect their partners and show what they really think about their enemies. At home, or at the beach, or in the middle of a wedding, any place is good to play this easy to learn multi player party game.